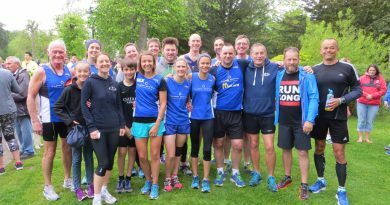 It is great when Tuff Fitty can help people towards their multisport goals, but it is extra special if our club can claim even a small part in matchmaking. Andy Strong & Kirsty Keith have both been members for over ten years and they got together at one of our Club Lido events at Arundel. 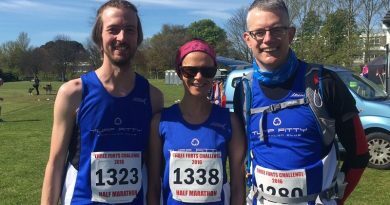 They have remained keen Tuffs despite their work taking them to live in Walton-On-Thames where they race under the Tuff banner. 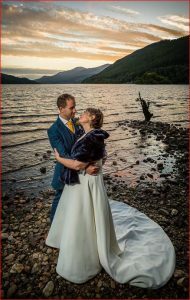 With her Scottish roots Kirsty & Andy decided to get married on the banks of the River Tay at the end of Loch Tay, Perthshire at Scotland’s oldest Inn – Kenmore Hotel. The day saw beautiful blue skies and warm sunshine. 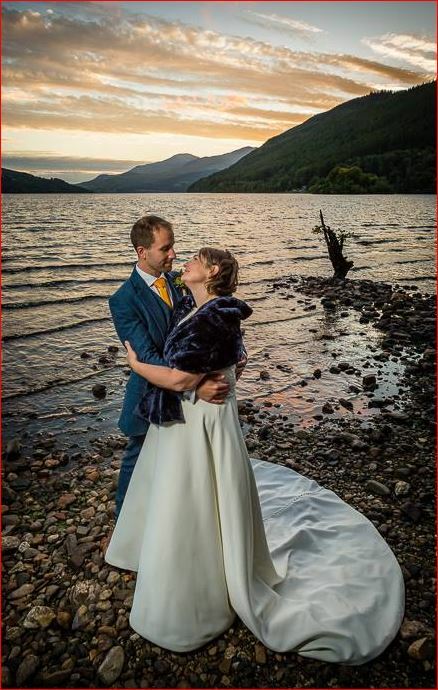 On behalf of everyone at Tuff Fitty we are delighted that they have become Mr & Mrs Strong and we wish Kirsty & Andy every health and happiness for their life together. 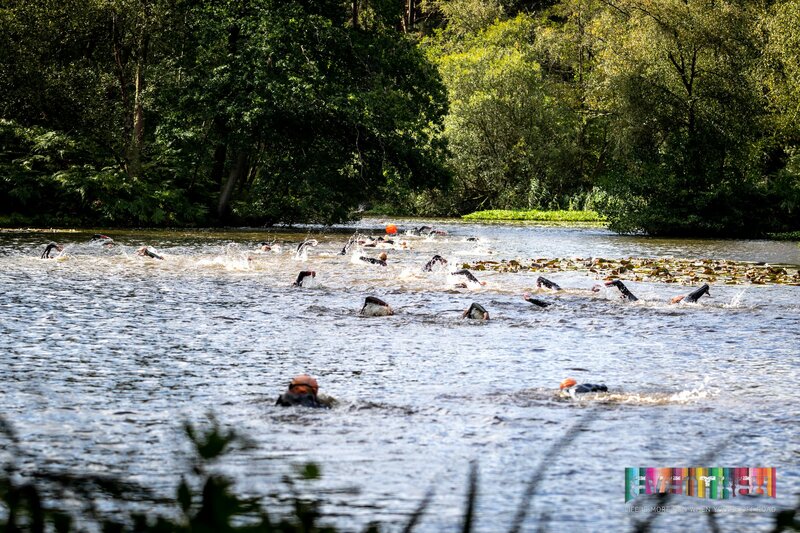 “What better way I thought to end the season with a nice relaxing off road triathlon in the Ashdown Forest, oh how wrong could I be. 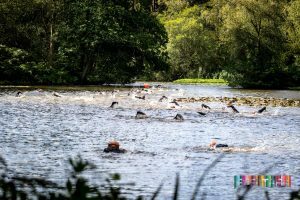 It was the first time this event by Eventrex had been staged at Pippingford Park, it was a small event that offered the ‘Full Fat’ triathlon, which was billed as a 1000m swim, 22km bike and 8km run – easy! There was also a ‘Sugar Free’ version which was half the distance. Race KO was 10.30am, a nice reasonable time. This gave all competitors a chance for a bike recce on a 6km section of the course, this was on a technical part of the course that also had a longish downhill section with short sweeping turns and a few jumps. This was going to be fun, but at the same time challenging! I made myself take the recce easy, a few got carried away coming back into transition with cuts and bruises even before the race had begun. After a good race briefing we trotted off on a 10min walk to the first lake for the swim start, the lake was a little bit chippy (16 degrees) and lacked any sort of visibility. There were three lakes we had to swim through with a short run between each of them. A mass start saw 75ish starters head towards a narrow gap in a lake that wasn’t that wide to start with this made the first few hundred metres pretty interesting. 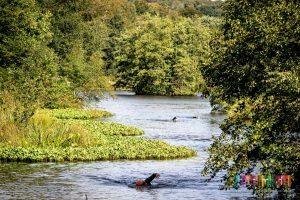 It was hard to get into any sort of rhythm as the lakes were shallow in places, meaning you were either swimming, walking, swimming, sinking in mud or swimming – it was tough going but I had a smile on my face all the way through with a couple of swigs of sediment for good measure. 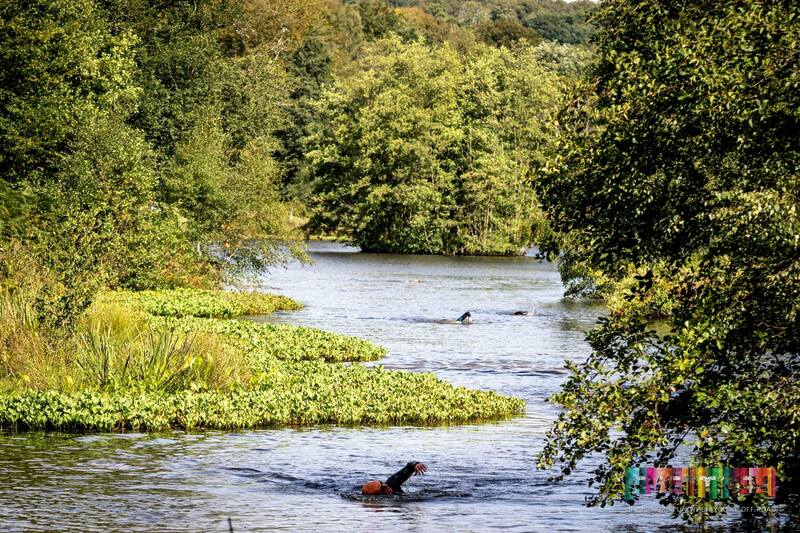 At points it was like swimming through one big muddy puddle, it was like an episode of Peppa Pig (oink oink). After a short run back up the hill to transition, a quick’ish change I was out on the bike for two loops of the 11km bike course. I kind of knew what to expect from the recce, but the ride was a lot lot tougher than I anticipated. 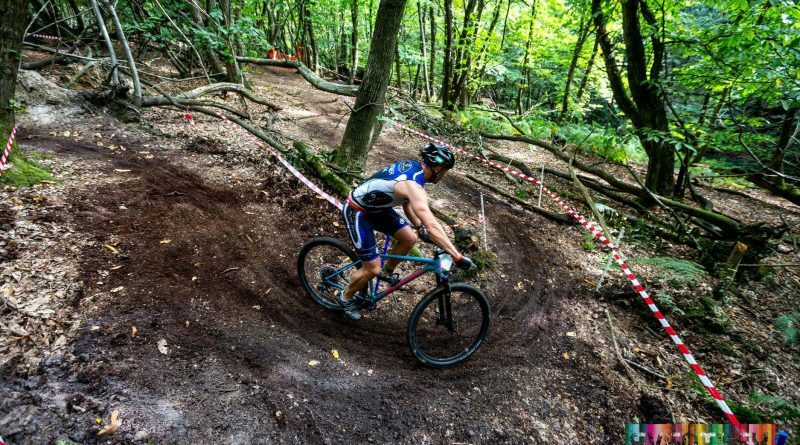 Not only technical, up hills and downhills, but plenty more hills on the easier sections – it was relentless! 500m of climbing over the 2 loops the legs never rested and I was glad to hit transition at the end of the second loop, but I can honestly say I enjoyed every minute of it. Heading off on the run my legs were heavy, this was going to be hard with two laps of a 4km undulating run course to complete. The first part of the course heading up hill through fields, then running downhill through a wooded technical section of single track with twists, turns, tree roots and ditches, before heading back out into the meadow and into transition. One lap down and I could feel the cramps in the quads and hamstrings starting to kick in. I managed to make it back up to the top of the hill, a quick stretch and a quiet word with myself I started on the downhill stretch back to the meadow and one last effort over the finish line. That was one tough race but great great fun, if I have it in me at the end of next season I would definitely sign up for this again. 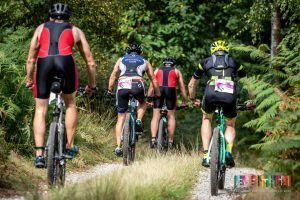 This sportive started at the Hickstead Showground, sponsored by the Ditchling based bike company who produces the Orro. 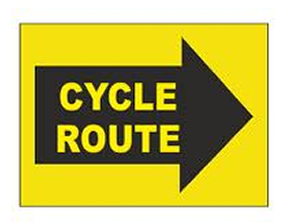 Three routes to choose from and Paul Atkinson undertook the top one- the Epic distance of 99miles which incorporated 6079 feet of climbing – Well done to Paul who completed in ‘Gold Status’ time. This local 10k starting on the Green at Littlehampton, staged by Chestnut Tree House, has become a major funding event; this year they are on track to raise £60,000. 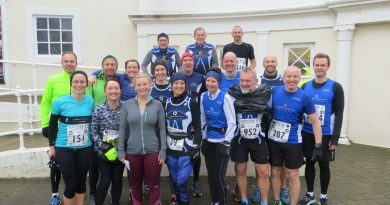 There was success out on the course as well with Pete Littleboy, first Tuff home in a great 42:47 to cross in the top 50 – good work out of 1,212 finishers. Well done to Matt Staniforth, Michael Redgrave & Amanda de Ridder. For such a worthy cause – it is worth congratulating Chris Robinson who helped to sponsor the event through his business Boost Marketing with sticks of rock for the goodie bag. Also congratulations to Claire Moyle who has reported in with her thoughts on the event. 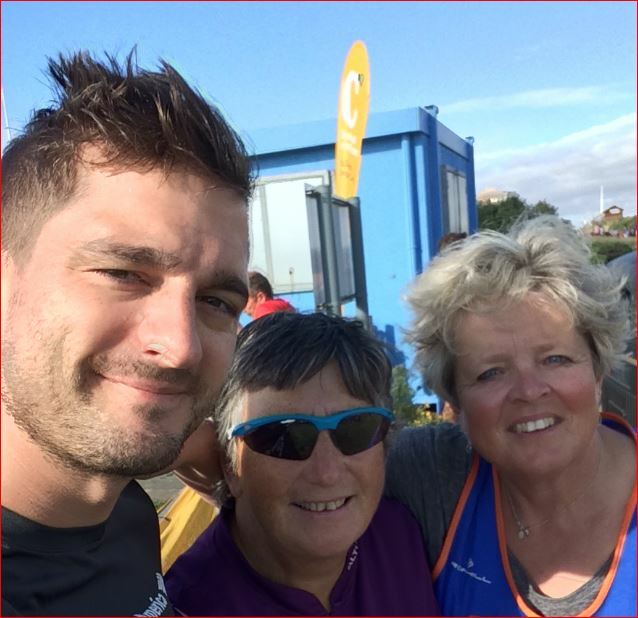 “Not sure why but I thought that as my season had been all about endurance I would enter the Littlehampton 10k. (Endurance for me) I think it must be 2 years since my last 10k and spent most of last year injured. The weather was lovely and sunny and despite the windy conditions it was very pleasant. I planned to keep an even pace throughout and concentrate on my breathing and before I knew it I had past the half way point and was thinking about finishing. Nothing spectacular and 2 minutes slower than my last 10k, but had fun and recovered well. Fraser also ran which was good as we had both encouraged my best friend to start running at the beginning of the year and she also ran and finished”. Tuffs made appearances at just two Park Runs this weekend. Across at Bognor Park Run Jason Rae continues inexorably towards his hundredth Park Run – this was his 97th. 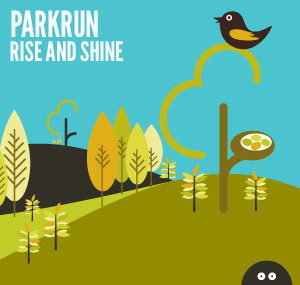 Worthing Park Run saw Dave Priest, Amanda de Ridder, Cathy Oliver & Elaine Rousseau run; well done to them all.